Is the top BJP leadership convinced about the authenticity of the documents related with corruption charges against Prime Minister Narendra Modi, first made public by editor, Economic and Political Weekly (EPW), Paranjoy Guha Thakurta, and in possession of Supreme Court advocate Prashant Bhushan, Delhi chief minister Arvind Kejriwal and Congress vice-resident Rahul Gandhi? If would seem so, if a recent tweet by Rajya Sabha member of Parliament (MP), Subramaniam Swamy, is any indication. Retweeted by as many as 3,200 persons, Swamy’s tweet asks Jaitley to “order an inquiry as to how Buddhu (the term Swamy is known to use to identify Congress vice-president) got Income Tax raid documents”. Gone virtually unnoticed, the tweet, which has received 4,375 likes, and is dated November 21, the day Gandhi addressed his rally in Mehsana, further wondered how could the documents, “kept” in the Union finance Ministry’s “secret vaults” come out in the open, insisting, “We must know who gave” these documents to “Buddhu”. Pointing out that documents relate to the period when Modi was Gujarat chief minister, Thakurta added, “In the documents, there appears to be a repetition of four specific transactions, which took place between October 30, 2013 and November 29, 2013 and have been accounted for under two separate headings”. “These entries and emails were meant for internal consumption. It is by pure chance that these entries have become public. However, it is in both the Congress and the BJP’s interests that these records are not investigated”, Khetan says. Where is the "Admission". Not even a twisted interpretation can show any admission on Swamys on the documents being original. Presstitutes all of you. Documents no one is denying whether they are worth as evidence or someone created for fabricating other is the point. U r good at twisting it based on your own way. And Supreme court rejected them as evudence. Arun Jaitley is the biggest traitor of BJP. No one should try to ' smart' over SC whether he is ' buddhus' or ' boddhas'. Rahul showed some documents supposed to be income tax claiming modi took bribe. 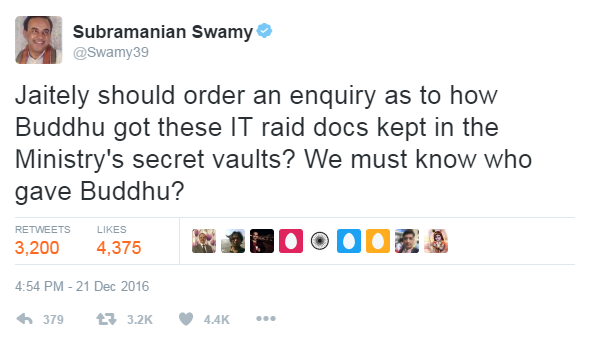 And donkey swamy is asking how Rahul got those documents which is supposed to be confidential. What's the meaning of it then? "Gone virtually unnoticed, the tweet, which has received 4,375 likes"!!! What a hilarious contradiction. Swamy is targeting Jaitley once again. Wake up guys, Swamy WANTS Jaitley's job and perhaps he may also be better at it than Jaitley with a law background can deliver. If somebody writes in his diary the name of RaGa or SoGa, would it mean that's an evidence. Why Thakurta is silent on Shiela Dixit. Has Thakurta approached her to get her reply?